Error occurred when using server_name in the discovery process. The RPC server cannot be contacted. Check that the server name is correct, that the server is on, that Citrix XenApp is installed on this server, and that the Citrix MFCOM Service is running. 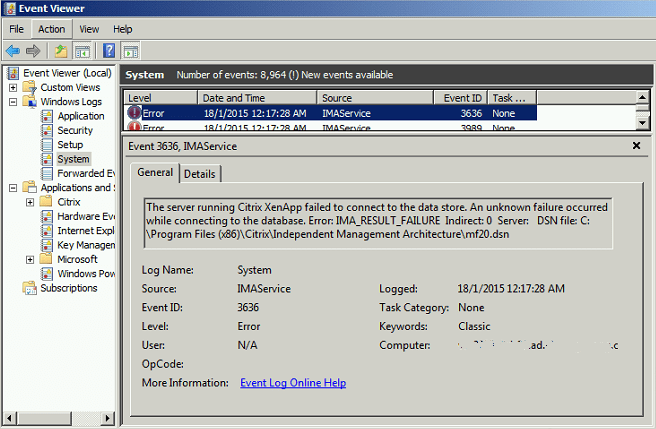 In Windows Server’s Event Viewer, several entries are logged even though the services related to Citrix XenApp are starting up fine. Citrix XenApp failed to connect to the Data Store. ODBC error while connecting to the database: 37000 -> [Microsoft][ODBC SQL Server Driver][SQL Server]Cannot open database “MF20” requested by the login. The login failed. Citrix XenApp failed to connect to the Data Store. 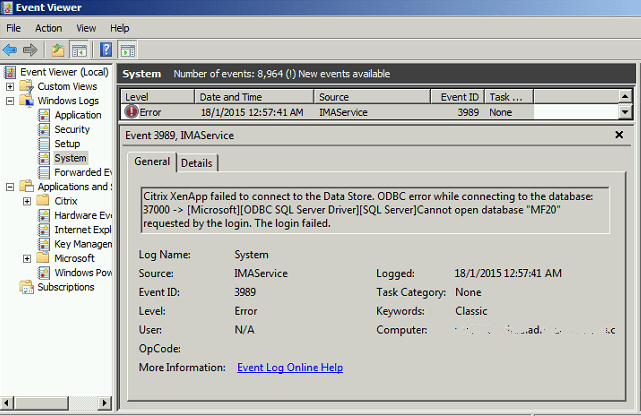 ODBC error while connecting to the database: 28000 -> [Microsoft][ODBC SQL Server Driver][SQL Server]Login failed. The login is from an untrusted domain and cannot be used with Windows authentication. The server running Citrix XenApp failed to connect to the Data Store. Error – IMA_RESULT_FAILURE. An unknown failure occurred while connecting to the database. The server running Citrix XenApp failed to connect to the Data Store. 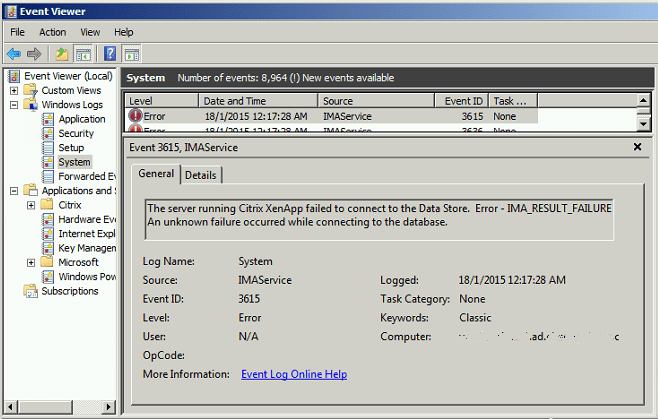 Error – IMA_RESULT_ACCESS_DENIED. Please make sure they are correct. If not, use DSMAINT CONFIG to change them. The server running Citrix XenApp failed to connect to the data store. An unknown failure occurred while connecting to the database. Error – IMA_RESULT_FAILURE Indirect: 0 Server:DSN file: C:\Program Files (x86)\Citrix\Independent Management Architecture\mf20.dsn. The server running Citrix XenApp failed to connect to the data store. Invalid database user name or password. Please make sure they are correct. If not, use DSMAINT CONFIG to change them. 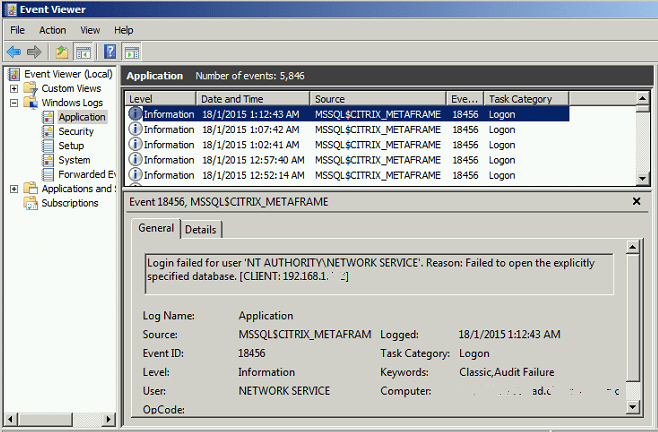 Error – IMA_RESULT_ACCESS_DENIED Indirect: 0 Server:DSN file: C:\Program Files (x86)\Citrix\Independent Management Architecture\mf20.dsn. Login failed for user ‘NT AUTHORITY\NETWORK SERVICE’. Reason: Failed to open the explicitly specified database. [CLIENT: 172.168.1.10]. All the issues are caused by corrupted or invalid user credentials used by Citrix IMA to connect to the database. To fix the issue, use DSMAINT utility to update the configuration parameters used by Citrix to connect to the data store. Attempting to connect to the data store with new configuration settings. Successfully connected to the data store. Please restart the IMA Service for changes to take effect. After running the command, restart IMA Service (Citrix Independent Management Architecture) for changes to take effect. 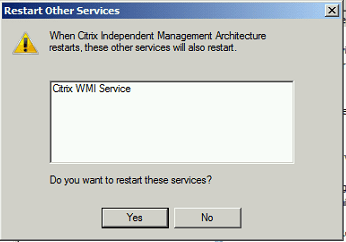 Restart also the related Citrix services if prompted. 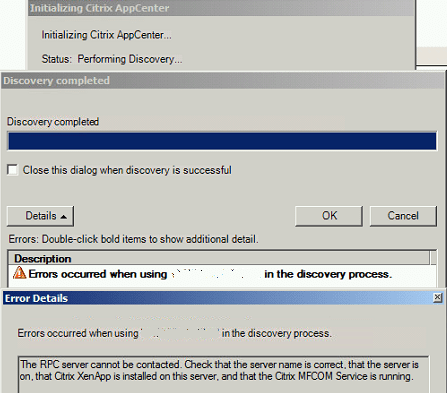 Then, the Citrix AppCenter or Citrix Delivery Services Console will be able to connect to data store for discovery to be successful.